Hi friends! 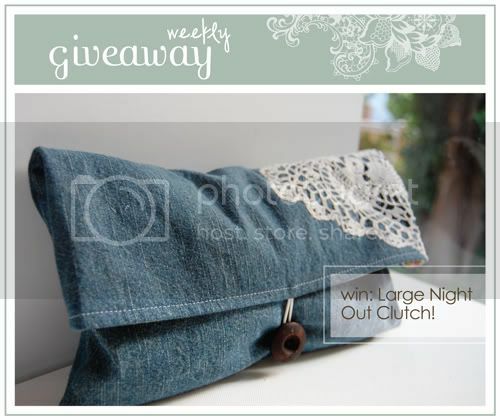 For our giveaway this week, we have a beautiful lace clutch from Jessie at Tiny House! She makes the most lovely items and is just the sweetest! and she lives in Seattle, my favorite ;) Be sure to stop by her blog for some tutorials too! Large Night Out Clutch: This clutch is perfect for a night out on the town. Pretty and stylish--and roomy to boot--this purse will hold all of your essentials. Denim outside, with a pretty vintage doily applique, and lined with a beige floral cotton. A wooden button and elastic loop keep it closed. Double-interfaced for sturdiness. Closed, it measures approximately 7" x 12", and opened it measures 12" x 12". Retails for $25. Please tell us a little about you and how you got started with your shop: I have a degree in visual art from the University of Washington, speak a bit of Spanish, and have been a waitress, receptionist, assistant, book keeper, tutor, and nanny. Now I'm a picture-taking, sewing, painting, drawing, knitting, quilting, card-making, thrift store shopping, stay at home mama to one little boy. I'm also working on my birth doula certification, and look forward to helping many women and their partners bring their children into the world. How did you get started sewing and making all your lovely things: I have always loved to make things with my hands, whether drawing, sculpting, painting, sewing, or scrapbooking. My latest sewing obsession began when we were living in Boston and needing extra money, and has evolved into a part-time position that I can do while caring for my son. Favorite place to travel: I love road trips! My family has always taken trips to visit family, leaving Washington state and driving either to California, Nevada, or Arizona, or to South Dakota, Illinois, and Minnesota, depending on who we were visiting. I really like visiting all the special places along the way, like Crater Lake in Oregon, Devil's Tower in Wyoming, or the Grand Canyon in Arizona. Someday, I hope to do a European tour--hitting all the big cities, as well as some of the more quaint villages. Any advice for aspiring artists and people who are thinking about opening a shop: Do it! There's never going to be "the perfect time" so just jump in! Etsy is awesome for me, but I've heard good things about Dawanda, 1000 Markets, and various other online venues. I also have good luck at local farmer's markets, and craft fairs. Fortunately the Seattle area is great for artists and crafters! Favorite inspiring links + blogs: As a mama, I love to read Amanda Blake Soule's blog, http://soulemama.com, as well as Erin Wallace's blog at http://bluebirdbaby.typepad.com/. Both of these women are inspiring in so many ways, and their photographs are beautiful. Visit Tiny House and leave a comment with your favorite item from their shop. feel free to spread the love around your blogs, twitter, etc! it is greatly appreciated friend. giveaway ends on monday, september 28 at 8am, pst. great giveaway danni + jessie! my most favorite item is the zipper pouch, squirrels. it is super cute and super autumnal. thanks! I love the zipper pouch!! beautiful items! The fabrics she uses are too cute! I'm in love with the Squirrel Zipper Pouch! So many cute things to choose from and I'm actually trying to keep myself from spending money until my next paycheck, but I love the Reversible Patchwork Drawstring Bag in PINKS. Reversible patchwork bags. LOVE patchwork! What a great shop. Those crayon rolls are adorable! I wish those were around when I was in grade school; I would have been the coolest kid on the block. The rose studs in blue are lovely! What an adorable pouch! One of the items from the shop that caught my eye were the Icy Blue Delicate Rose Studs...so pretty! I love the Delicate Rose Studs in aqua! Oh, I adore the vintage handkerchief necklace! Those pretty pink and red roses and the soft fabric and embroidery are so charming! And the Night Out clutch is gorgeous as well. i am a big fan of lace and clutch, i love love the large night out clutch! gorgeous! i also love delicate rose studs. My favorite item is Cuff, Lace and Vintage Findings. The shop looks so nice! love the gray linen cuffs in her shop. so sweet! I just love that night out clutch! I'm from Seattle but studying in Massachusetts right now, so I love reading Jessie's blog about her family's adventures in the Puget Sound area! 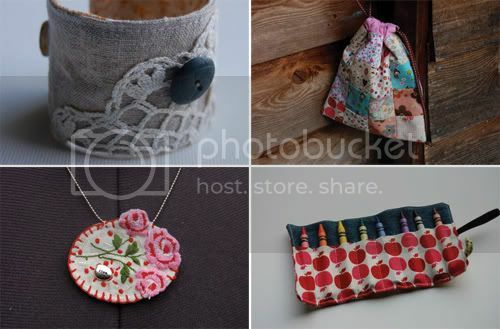 that necklace in the photos...the vintage hankerchief necklace is VERY cute! i love all of her work with doilies too though...and the red/pink apple fabric!! I love the doily accents! And the 3 Woodland Themed cards are awful cute. so cute! i love the cuffs! i think that the crayon rolls are adorable AND genius...sign me up please! I really like how this clutch isn't your typical glamorous hollywood kind of clutch, it's more pretty and delicate and therefore - more covetable! I love the Vintage Style Button Studs, Green Flowers!! or any of her stuff with squirrels! so adorable! definitely the crayon roll ups! Just right. Oh my, oh my, how I love the necklace with the Owl and the Dragonfly! I love the Vintage Style Button Studs, Green Flowers! I adore the squirrel zipper pouch!! What a cute shop! The Linen cuff - A cuff, linen, vintage lace, kerchief trim. Need I say more. JUST LOVELY! The Set of 3 Woodland-Themed Cards are just adorable! I know many many people that would love to receive these! The Set of 3 Woodland-Themed Cards are so cute! I love the Owl and Dragonfly necklace... so cute! Beautiful shop, I have noticed her before! I love the little crayon rolls, so cute and a perfect gift for a toddler! Beautiful clutch. I love the vintage hanky necklace! I think the button bobby pins are really cute! Ohhh, I just fell in love with the reversible patchwork drawstring bags! I like the Zipper Pouch, Red and Pink Apples! I like the, Zipper Pouch, Halved Apples and Pears, too cute. I love the fabric selections. I love, love, love the rose studs, and esp. the owl and dragonfly necklace! What a cute idea!! this is such a fabulous giveaway! i love the lace clutch--long for it, wish it were mine!! it's so beautiful and delicate. from the shop my favorite is the squirrel zip pouch. i love watching the squirrels on campus. we've got albino ones (though i've only spotted one so far). I think the vintage handkerchief necklace is so beautiful! That is my favorite. The entire shop is so pretty. Aww, what a cute giveaway! I really like the Reversible Patchwork Drawstring Bag in Pinks. The red apple zipper pouch is my favourite. Perfect for keeping my handbag clean. Love it! My favorite is the clutch you are giving away...ooooh how lucky could I be?? Love the Hey Cupcake, Original Painting. the delicate rose studs in slate grey... but i love the clutch even more! my fave is the reversible patchwork drawstring pouch. i love patchwork anything! oh those crayon holders are darling!!! "There's never going to be "the perfect time" so just jump in! "- perfect advice! How great! and there are such cute stuff in her shop! I really like the Crayon rolls. Such a smart idea also! I guess squirrels are all the rage this fall. Cute! Love that coffee sleeve too. Such a fun shop/mix of items. Happy Thursday, Danni. Thanks for your ongoing pretty inspiration! Lovely giveaway! I like the Animals & Fruit Crayon Roll. The fabric is so cute! Ohh, I love love love the "Cuff, Linen and Vintage Findings". i <3 the cuff linen & vintage finding! its adorable! i cant wait to wear it and i also <3 the delicate rose studs slate gray! they would match with everything!!!!! Zipper Pouch, Halved Apples and Pears! 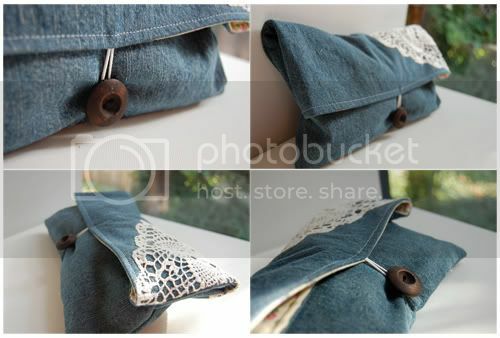 I also adore the blue jean clutch featured in the article! Oh this clutch is just to die for! okay so I loved the Linen and Vintage Findings Cuff it is so enchanting and fresh! I just love the Icy Blue Rose Earrings. Pretty...pretty!! Thanks for the chance to win such a great giveaway. The squirrels zipper pouch is adorable! I dig the Vintage Handkerchief Necklace with Charm that is on SALE on Tiny House. Cool Interview! I'm definitely lusting over the "Zipper Pouch, Halved Apples and Pears"
You both are so generous! I am loving the crayon rolls. They are so smart and use can use them for so many things too! The clutch is so awesome too! The Crayon Roll with Green apples is my fave. Who doesn't love a bouquet of newly sharpened pencils afterall. This was VERY difficult...but my favorite item is the Set of 3 Woodland-Themed Cards. I've recently started sending more 'snailmail' to family and friends. I'm noticing that I gravitate towards funky little note cards more and more now. I'm in love with the Squirrel Zipper Pouch definitely!!! Oh I love their Toadstool Necklace. It's so awesome! My fingers are crossed for the win! The Delicate Rose Studs in Icy Blue are so adorable. I would love to have them! They're sweet enough for every occasion.